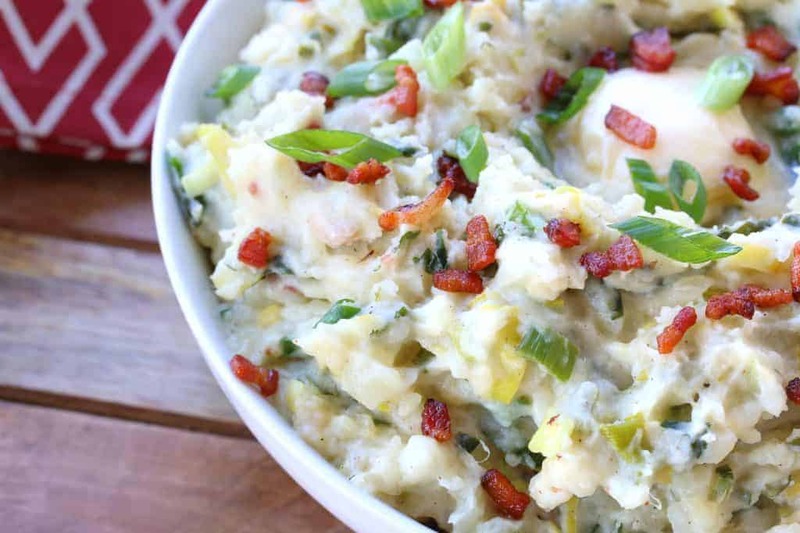 Traditional Irish Colcannon…bumped up several flavor notches! Ah, potatoes. What would life be without them? Yet for the longest time everyone in the world did just that – lived without them. All except the residents of southern Peru, that is, where the potato originated. 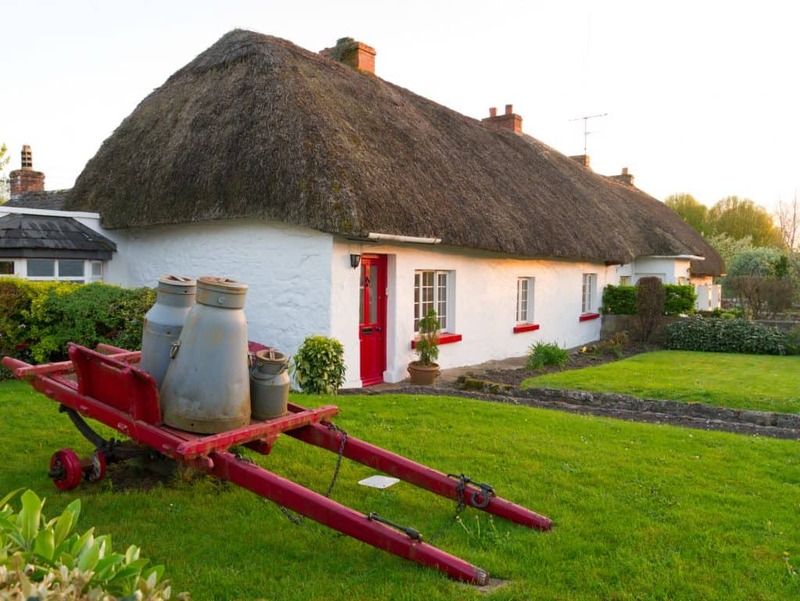 While it’s hard to imagine Irish cuisine without potatoes, they weren’t introduced to Ireland until the late 1600’s. But the Irish embraced them with such enthusiasm that they have forever remained an integral part of Irish fare. Historically potatoes were the food of the peasants, cheap and filling, and when combined with kale, cabbage, butter and cream, the Irish were able to catch a taste of heaven after a hard day’s work. This dish became known as Colcannon, first recorded in 1774 though likely much older, and became a satisfying staple food that was traditionally eaten all year round. It has remained one of Ireland’s most iconic national dishes. And we’re just crazy about it! 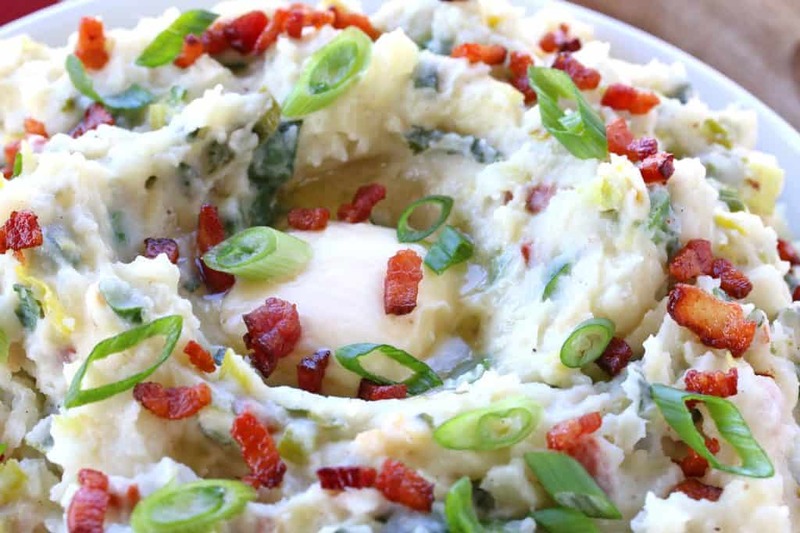 Why “ultimate” colcannon? 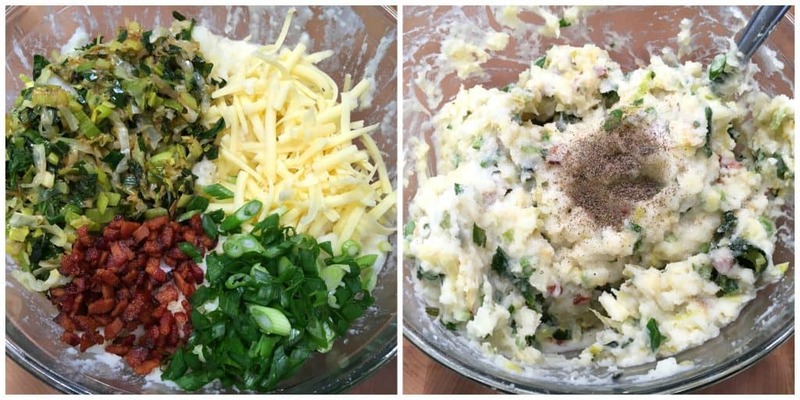 Because it’s a LOADED version traditional Irish colcannon. Colcannon traditionally combines the potatoes with either kale, cabbage or leek. We’re using all three to get the best of each flavor (leek especially adds an incredible flavor). Traditionally cream and butter are used – we’re also adding bacon and folding in some Irish white cheddar! 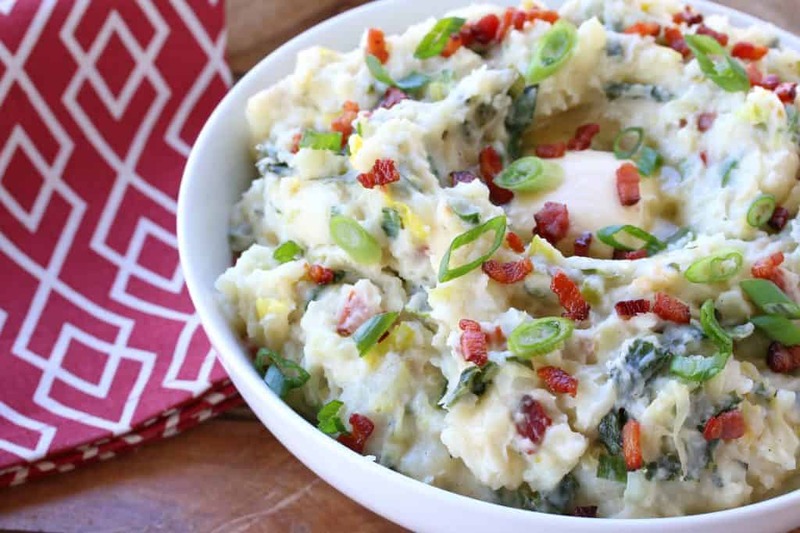 Combine that all together – mashed potatoes with lots of butter, cream, sauteed cabbage, kale, and leek, green onions, bacon and Irish white cheddar – and you’ve got a bowl of absolute heaven! 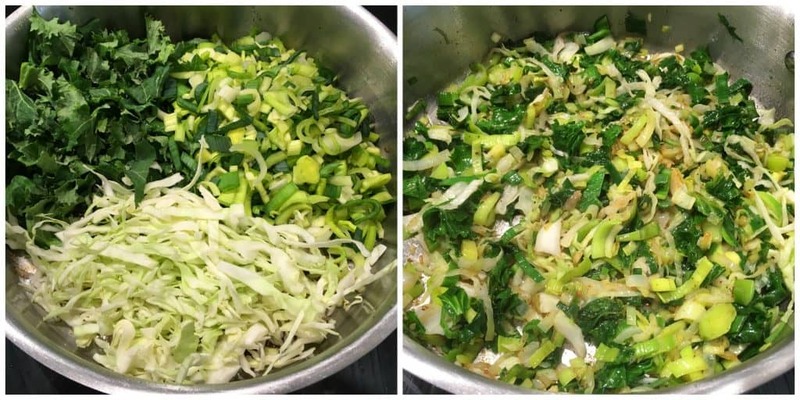 Chop the kale, shred the cabbage and chop the leek (be sure thoroughly rinse and drain the leek in a colander). Fry the bacon until crispy then use a slotted spoon to transfer it to a plate until ready to use. Leave about 2 tablespoons of bacon grease in the pan. Add the chopped greens to the pan and saute them in the bacon grease until soft, 7-8 minutes. 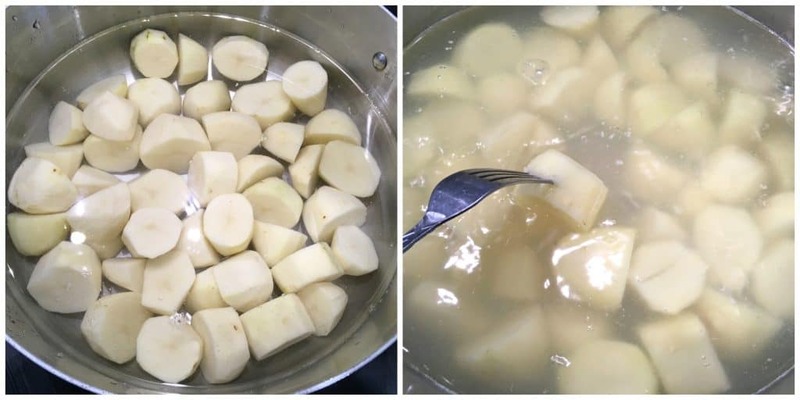 Boil the potatoes in salted water until soft. Very thoroughly drain all water from the potatoes. While the potatoes are still piping hot, add 2/3 of the butter, warm milk and cream. Use a manually masher to mash the potatoes. Add the cooked greens, bacon, green onions and white cheddar (reserving a little bacon and green onions for garnish). Stir to combine. Add the salt and pepper. Taste and add more salt according to preference. Spoon into a serving bowl, make a small well in the center and add the remaining 1/3 butter in the well. Garnish with the reserved bacon and green onions. Serve immediately. 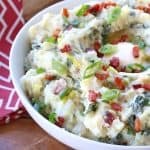 Traditional Irish Colcannon...bumped up several flavor notches! We're using kale, cabbage and leek along with bacon and Irish white cheddar. It's pure heaven! Fry the bacon in a large pan until crispy then use a slotted spoon to transfer it to a plate until ready to use. Leave about 2 tablespoons of bacon grease in the pan. While the greens are cooking, start the potatoes boiling. 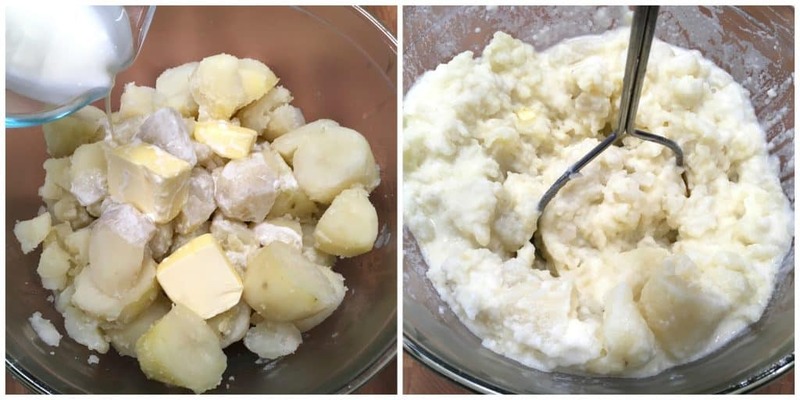 Boil the potatoes in salted water until soft. Thoroughly drain all water from the potatoes. I’ve never had this but it looks like something I need to try! This is about to be out new favorite side dish! It’s full of everything I love! Heart be still, I am in love!!! I am going to have to try these out soon! They look so good! I’m suddenly feeling very Irish. Looks delicious. I’m not usually a huge cabbage fan, but when you add all these other fantastic flavors… I’m all in!! This would go well with our Irish feast this weekend. I have never had it before but oh my, this looks too good not to try! I love making themed dishes for the holiday but this sounds so delicious, it might just stick around all year long! Okay, this was amazing!! Gave it a test run for a dinner party I’m having this Saturday for St. Patrick’s Day. This one’s going to be a total hit, thank you! Oh wow this looks AMAZING! Saving! My family is Irish so I’m digging this one. 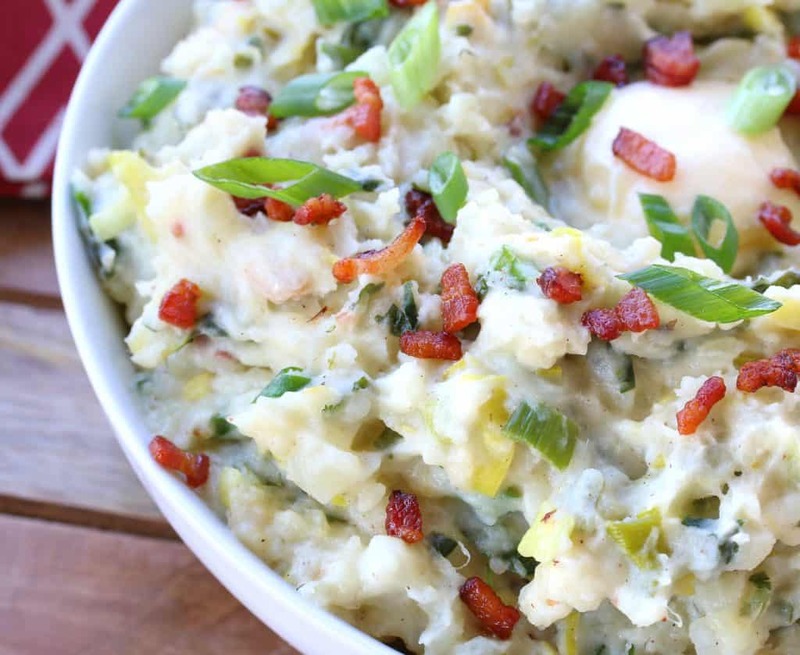 We love colcannon and pretty much every potato dish out there. This one is absolutely stunning. I’ve never seen a prettier colcannon in my life. I don’t know why I’ve never had this because it has everything I love! Can’t wait to try this! This dish is fully loaded and will be fully devoured in my house! Wow!! I love making a themed meal to celebrate holidays! Adding this delicious beauty to the line up, thanks! Craving for this! Can’t wait to give it a try! This needs to be made at my house this weekend! Is it alright to make this ahead of time? Hi Tara, yes they can. Be sure to add that last 1/3 stick of butter just before serving and that will “freshen” up the potatoes. Wonderful, Mallory, I’m so glad you enjoyed it, thank you! This looks totally AHH-mazing! I can’t wait to give it a try! Absolutely wonderfully and incredibly delicious, the BEST colcannon I’ve ever had! Will definitely be making this again! Another fantastic dish. This is the forth or fifth dish I have made from your site and once again it’s a family favourite. I’m so happy to hear that, Jeff, thank you! My mother always made this at Halloween- it was traditional in Ireland when I was a child to hide fortune telling items inside it wrapped in tinfoil or greaseproof paper: a coin for rich, a rag for poor, a ring for marriage and believe it or not a stick to beat your wife! Maybe that meant unhappy marriage. Looking at all the recipes online they all seem very “white” to me. ie too much potato. My mum’s version was much greener ie much more curley kale and no other ingredients just potato, curley kale and butter. I loved it and still do- it’s my favorite way to eat green veg. Fantastic, Bob, thanks so much for the feedback! My first experience with Colcannon and I’m in love. Easy to follow recipe and delicious. Amazing how a few basic, inexpensive ingredients can come together, visually appealing too. I think my Irish Grandma would approve and my German Grandma would be a wee bit jealous! Thanks for sharing this wonderful recipe. Love new experiences with food. 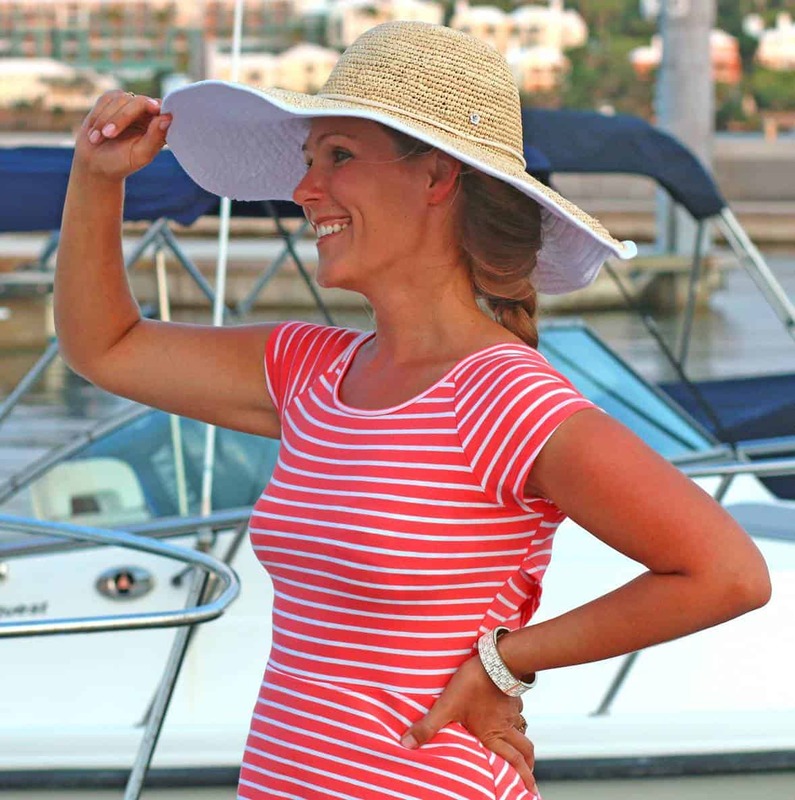 I’m so glad, Elizabeth, thank you for the feedback!